If you like High Voltage rock’n’roll and you’re on a Highway to Hell into Rock’n’Roll Damnation, then dig out that old school uniform and… Let There Be Rock! Hells Bells. Okay, I know that introduction sounded like a corny opening to the Tommy Vance Friday Night Rock Show, but there’s no doubt about it, AC/DC have made their mark on rock’n’roll history. Back in Black is one of the biggest-selling rock albums of all time and this classic track from almost 30 years ago still sounds as fresh as a daisy. Although the band hail from Australia, both bothers (Angus and Malcolm) were born in Scotland and were no strangers to the trappings of superstardom thanks to one of their brothers, Alex, who adopted the name George Alexander, teamed up with Dutch guitarist Harry Vanda and formed The Easybeats. The band became megastars in Australia (where the family moved to in 1964) and achieved worldwide success and recognition with their hit ‘Friday On My Mind’. The pair later went on to form a production team (Vanda and Young) and produced AC/DC’s first few albums. Their mother also contributed to the story by suggesting the band name after seeing it mitten on a vacuum cleaner! Thus history was made. We couldn’t quite get the 4,000 lb bell but everything else is there, so let’s get down to business. Guitar 1 is Angus with his stock Gibson SG, apparently the only type of guitar he’s ever owned, through a Marshall. Be sure to keep the sound fairly clean by using the power amp stage (big tubes, master volume) more than the pre-amp stage (little tubes, input volume). As an aside, I’ve seen various transcriptions of this intro and they’ve all been somewhat wide of the mark, but I’m 99 per cent certain that this is the way Angus himself plays it. Notice in bar 25 where Angus is playing around the seventh fret and Malcolm, (Guitar 2) who uses a Gretsch with an unusually shaped tail piece, is doubling the same thing an octave lower on open strings. Malcolm tends to stay around the open position, whereas Angus may play the same notes but in a different place on the neck. For example, in the last part of bar 29 where Malcolm plays the D5 with the open D string and Angus is playing the exact same notes around the fifth position. Simple, but effective. In fact, anyone who’s played AC/DC covers knows how much fun they are to play live. My own personal favorite is ‘Riff Raff, and I still use AC/DC riffs when sound-checking. For the most part things are kept pretty simple until the solo. The solo starts with some lovely blues phrases in bars 82 and 83 which lull you into a false sense of security before taking off like a jet engine in bar 85. If you want to sound similar, then total energy and conviction are required, as well as a wicked vibrato technique. To achieve his vibrato, Angus generally uses all four fingers on a string, possibly because he has fairly small hands and also because he runs around like a lunatic and sweats so much! Double-stops are an important part of his playing and I think that the ones in bars 87-88 are probably played using pick and fingers to get that staccato effect. Unison bends are also a common feature with Angus, and good examples of that reside within bars 92 and 93. Back in Block, Let There Be Rock, Powerage, Highway to Hell – it’s all good stuff. If you’re into sound-alikes then you may want to check out Rose Tattoo (also from Down Under) and Cinderella. 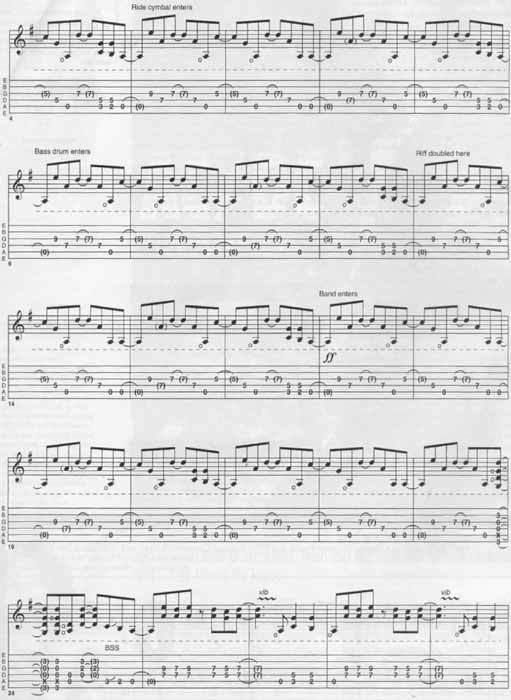 It’s just a part of AC/DC Hells Bells guitar tab and sheet. © 2012 - 2019 TabsClub Powered by TabsClub 42 queries in 0.275 seconds.